Our high quality, electrical energy saving Occupancy Sensor are PIR based sensors and used for the automatic switching of electrical appliances of up to 1000VA. The sensors can be easily integrated with any existing power device. To upgrade the existing range and technology used, we are engaged in providing Occupancy Sensor. This sensor is ideal to detect human presence in houses, industries by calculating human heat. At our advanced production unit, the offered sensor is manufactured using superior quality components with the aid of sophisticated techniques by our adroit professionals. Additionally, our valued patrons can avail this sensor at competitive prices from us. 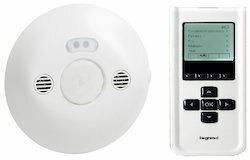 Looking for Occupancy Sensor ?